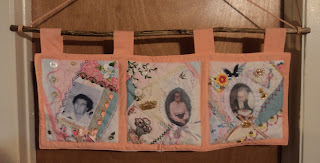 I have posted a few progress pics of the first 3 of these projects which are now complete! Along with the first 3 I have 2 more completed as well so I've been a busy bee..these 2 are for my own 2 boys. I have 3 more ready for the finishing touches but have to wait for my son to finish making more hangers... each panel is hung on a hand curved piece of wood which my 12 yo son has curved from tree branches, then stained and varathaned by hand. I am sure that all the members of your family who receive one of these gifts from you and your son, will be absolutely thrilled. They are really lovely, Lorrie, congratulations. Lorrie these are beautiful...now we know what you have been up to...very special! Looks beautiful! Those will a heirloom for the receivers! Nice stitcing around the pictures. You have been a busy lady!!! Oh my! These are gorgeous...and wonderful tributes! What great presents to receive!